I’ve been giving much thought about the investment philosophy behind the post over at Philosophical Economics about the GTT market timing model. To understand what`s behind his investment philosophy, let`s start back with first principles of equity investing. The equity claim represent the “stub” claim behind debt, or bond financing in a company and therefore represent greater investment risk. Financial theory holds that higher risk should be rewarded with higher expected (average) return. While equities earn more than bonds, on average, they will be subject to higher levels of risk. What constitutes an aggressive Fed? Here is my investor market timing model: If the market environment is friendly, buy and stay long stocks. If it is unfriendly, as defined by moderate or high recession risk or an overly aggressive monetary policy, then use a moving average based trend following model for to better tactically control risk. If you ask ten economists that question, you will get ten different answers. As a first order approximation, I focus on the Taylor Rule as a way of defining a neutral Fed Funds policy rate. 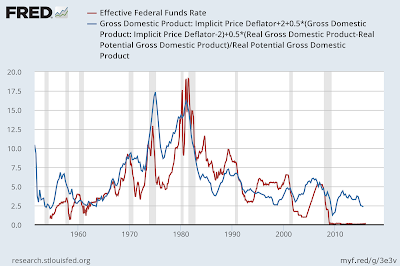 While the Taylor Rule can have several assumptions in its inputs, the FRED blog conveniently showed the way by calculating the Taylor Rule rate based on a 2% inflation target and a constant 2% real interest rate. Here are the SPX monthly returns under the three monetary regimes. Surprisingly, median monthly returns are higher under a tight monetary policy regime than an easy one, though the worst drawdown occurred under a tight policy regime. This initial analysis doesn’t give us many answers about risk management under different monetary policy regimes. We see more interesting results if we further segregated the sample to rising and falling Fed Funds within each monetary policy regime. It was not a surprise to see that equity returns are higher when FF is falling than rising, but we can also observe that drawdowns seem to be worse in each category under a tight regime. 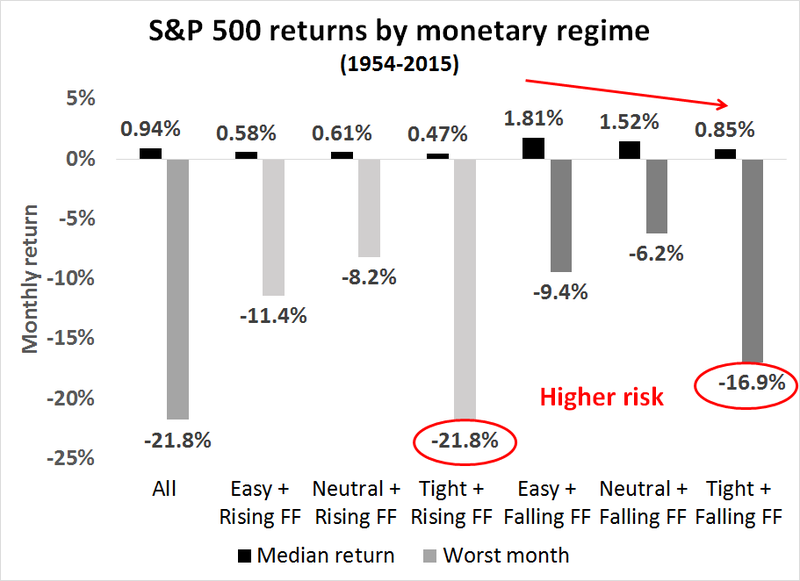 Moreover, median monthly returns fall monotonically as monetary regime goes from easy to neutral to tight, even when FF is falling. It seems that downside equity risk is heightened under a tight monetary regime. That observation about the higher risk characteristics of a tight policy regime is confirmed by the following chart showing the % of months the SPX is positive. 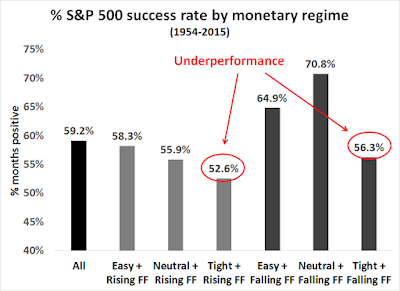 Within each rising FF or falling FF grouping, a tight monetary regime underperforms its peers. Recall the objective of this exercise is to measure the risk of an investment environment so that we can impose some extra risk controls to mitigate drawdowns. One way of measuring risk is kurtosis, which measures the fatness of the tails of a return distribution. Here is the explanation of kurtosis for non-geeks. When kurtosis is 0, it is an indication that a distribution is normally distributed (like diagram A). The higher the kurtosis, the fatter the tails. To give a better real-life interpretation of this measure: A risk-manager at a hedge fund once explained to me that once the kurtosis of an investment strategy gets above 2 or 3, he starts to get concerned about unusual fat-tailed events. 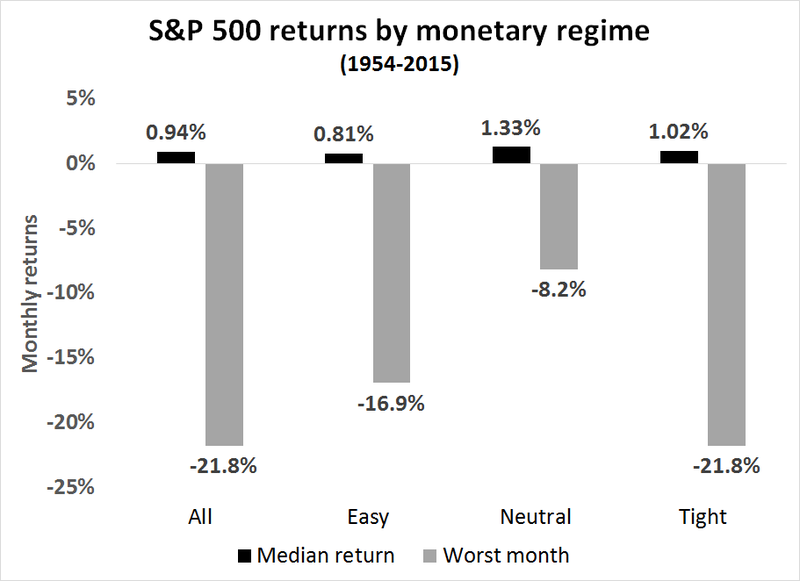 The chart below shows the kurtosis of monthly SPX returns under different monetary regimes. 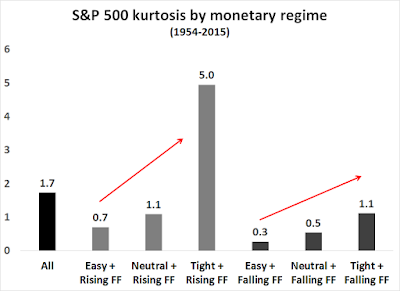 SPX return kurtosis rises as monetary regime changes easy to neutral to tight. It was highest when FF was rising under a tight regime. In other words, what this analysis tells us is that when monetary policy is tight, the chances of outsized moves are much higher than normal, especially when the Fed Funds rate is rising. What is the market timing model telling us now? 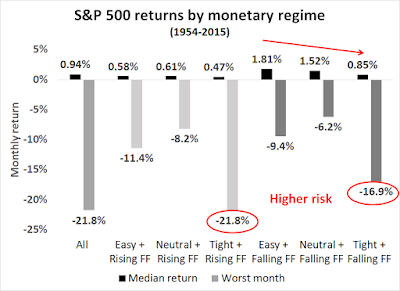 Jesse Livermore and I have slightly different ideas of what constitutes recession risk (see my Recession Watch monitor), but our conclusions won`t be that different in the long run. Currently, recession risks are low (see the discussion in my last post Bullish or bearish? What’s your time horizon?). As for the monetary policy regime test, the Taylor Rule target rate is about 2.3%, which is well above the current effective FF rate, indicating an easy monetary policy. Conclusion: The panel is green, investors should stay long equities. The current bout of weakness is only a correction, which can happen at any time and without much reason (as an example, see The Ebola correction? Oh, PUH-LEEZ!). This discussion about corrections does bring up an important caveat to this market timing model. This model is designed for investors who want avoid the kind of large drawdowns that are the result of prolonged bear markets. It is definitely not designed to avoid every single 10-20% correction that comes along. 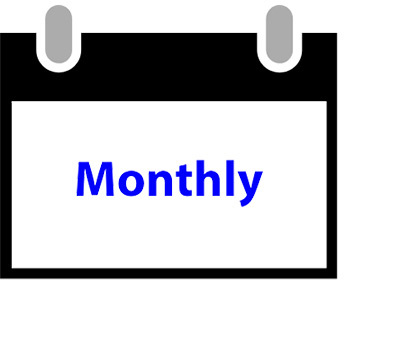 As the above analysis shows, even under neutral and easy monetary regimes, single month drawdowns of about 10% can and do occur. Equity investors have to be able to accept those kinds of risks, as they just come with the territory. Otherwise if you can’t stand the heat, stay out of the kitchen. Isn’t it true that the vast majority of greater than 20% market drops in the S&P 500 have come in times when no recession has come in the US? Is the “or” part (The Fed Funds rate exceeds the Taylor Rule rate by 0.5% or more) capturing the vast majority of the other drops? Here are 20 since 1929: 1929 (-44.7%), 1931 (-83%), 1932 (-40.6%), 1933 (-29.8%), 1934 (-31.8%), 1937 (-54.5%), 1938 (-26.2%), 1939 (-31.9%), 1941 (-34.5%), 1946 (-26.6%), 1948 (-20.6%), 1957 (-20.7%), 1962 (-26.4%), 1966 (-22.2%), 1970 (-36.1%), 1974 (-48.2%), 1982 (-27.1%), 1987 (-33.5%), 2001 (-49.1%), and 2009 (-56.8%). The early 1930s was the Great Depression, which this strategy would have sidestepped. Not sure about 1937 and 1938, there was a 1938 slowdown and Fed policy was probably too tight but we don’t have the data. As for the rest, see my reply to Joseph below. In no instance did the market go down for any other reason. which shows 5 non-recession 20+% corrections during your time period and 2 more in the years 39 – 54. Ok, 2 of those were only 19.3% but close enough. Several other good points about oil, earnings, and manufacturing not making a difference. Interested in your thoughts about all the points in the article. 1939-41 was WW II. Are you surprised that the market cratered when Hitler first overran Poland and then France? That leaves 1998 and 2011. No system is perfect, but you avoided a lot of drawdowns. 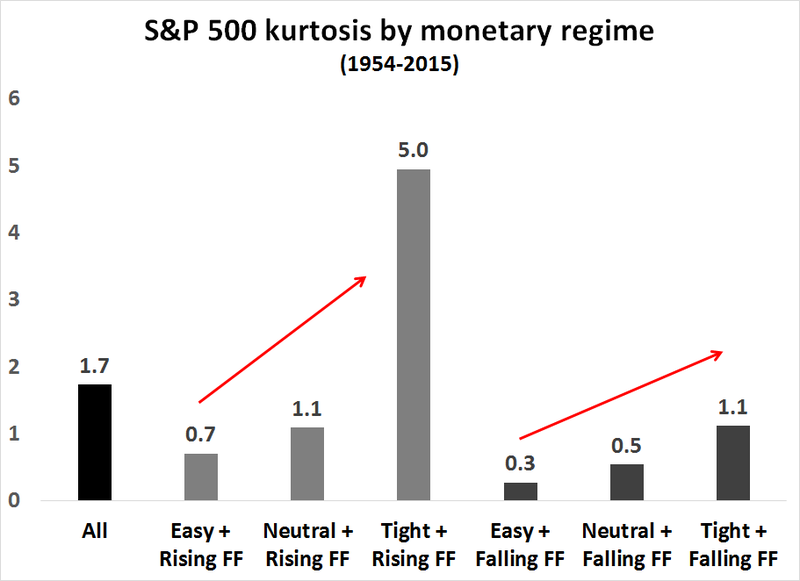 It appears that Underperformance as well as Kurtosis are just as bad or worse under Neutral + Rising FF regimes. Would it improve the performance of your model to incorporate this condition? The definition of rising FF is whether FF went up or down in the previous month. It’s difficult to predict Fed policy ahead of time so trying to time FF changes is not easy. On the other hand, the spread between the FF rate and Taylor Rule target is much more stable. I think this is the first time in history when all the Central Banks have had any easy money policy i.e. zero interest rates. Historically, that has led in most cases to bubbles or high high valuations. 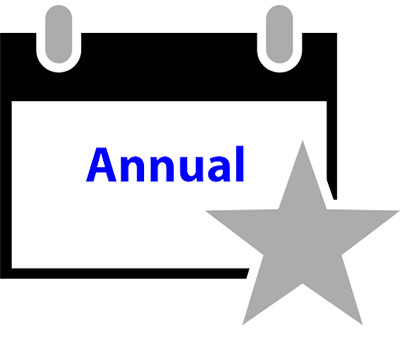 My contention is that the valuations that we are seeing (fang stocks) and the P.E. of the S&P before the correction was unjustified based on the fundamentals. 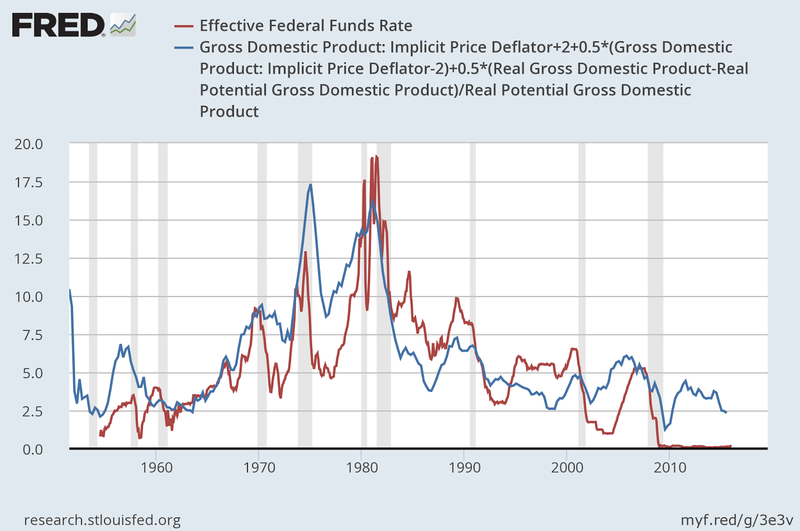 Therefore the normalization of interest rates (inflation + nominal fed fund rate) will cause a bear market. This would be the opposite of excessive tightening of the Federal Reserve. 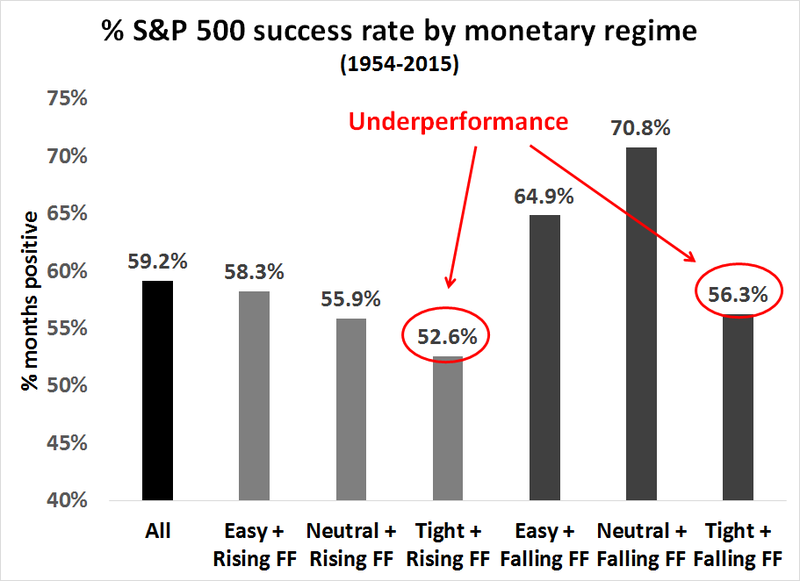 Remember, the definition of “easy” in my study is FF below the Taylor Rule target by 0.5% or more. If you back test this model how often does it trade? Your current model trades too often for my preference for investing. Otherwise use a moving average model to get out of the market, e.g. 200 dma. Based on those rules, it can be years before you actually make a trade. Is this going to be the foundation for your trend model going forward? This will not be the Trend Model, but a separate model that I will continue to report on. Remember that this timing model hardly ever makes a trade. Cam- Could you do a back test of your modification of the strategy using the SPX as the index for the 200 day MA portion of the strategy but using SPXL as the investment vehicle, also the same idea but using QQQ for the 200 day MA portion, but using TQQQ as the security to be held? What I have done here is I outlined a conceptual framework for market timing. If you want some backtested results look at the post at Philosophical Economics. My results should be slightly improved as the Fed policy rule allowed the investor to sidestep the 1987 Crash. BTW, SPXL is entirely inappropriate vehicle for backtesting this because of the NAV decay in leveraged ETFs, which are trading vehicles, not investment vehicles. This timing model can stay long for years without a trade. If you want leveraged exposure, then use futures. not leveraged ETFs. This is similar to what I was saying a couple of weeks ago when we were examining the long term results of various factors including my favorite MOMENTUM. Only use protective methods when necessary at a high risk part of the market cycle. In my experience, technical analysts make the mistake of using the same techniques throughout the stock market cycle. I also use Fed policy to define the risk level to decide if protective measures are necessary. I also in the past used value namely the Fed Model made popular by Zweig but T-Bill yields are so low now that it doesn’t work and Schiller CAPE is suspect in a extremely low interest rate world. I also use leading economic indicators. This could be extremely important this cycle. If we are in a very fragile economy as several wise observers believe then a smaller amount of Central Bank tightening than in the past might tip the economy into a recession. The Taylor Rule may not be a good predictor. This new thing will be tipped off by a drop in the LEI. Note that the LEI just had a very small drop. The definition of excessive tightening should be the level that causes the economy to contract not some previous normality. The sum total of things today tells me to stay long without protective programs. I was thinking about you when I built that model! Which is the truth value? Why are these two values different? Thanks for the explanation. Using the exponential moving average, I get a similar outcome. What about the work documented at the Atlanta Fed by Wu-Xia (https://www.frbatlanta.org/cqer/research/shadow_rate.aspx?panel=1)? Might this be a hidden or shadow tightening regime? I knew someone was going to ask about the shadow FF rate (SFF)! There are two ways of thinking about this. First, you have to distinguish between monetary regimes (easy, neutral, or tight) by looking at how far FF, or SFF, is relative to its Taylor Rule target. As well, you have to think about the direction of the change. What you have identified is a possible tightening (direction), though the actual FF is well below the Taylor Rule target (i.e. policy is still easy). The identification of monetary regime (easy) is far more important than direction to the market timing model as direction can be noisy and volatile. The second way of thinking about this is what the SFF rate tells us about the actual economy, as SFF is a theoretical rate and not an actual rate. (You can’t call up Morgan Stanley or Goldman Sachs and ask for a market in SFF). What it is telling us is that the economy has improved sufficiently that SFF is rising from a negative value to zero. This is good news, because it implies an improving economy. Regarding the GTT model do you consider SPY, VTI, IWM, IWF, & VEA, as appropriate vehicles for this model? Are there others that you would consider that may be better suited? Do you think it possible to capture sector rotation within the business cycle with this model using vehicles such as XLE? I am trying to think of ideas to improve performance. As you said above, this is a model that does not trade often. Do you think there is a way to bring in global diversification? I assume to do this one would have to look at particular country or continental macro economic signals? My point is that the GTT model appears to something with greater potential than has been discussed thus far.